Hotel-restaurant “Treff Bistro ” is located in the downtown (Shirok Sokak) area in a building with old, traditional, local architecture. Hotel’s lively entertainment and amenities will delight your senses and entice you to stay a little longer. Surrounded by some of the most well known points of interest in Bitola this beautiful hotel is ideally located on the main street Shirok sokak. Whether your plans include meetings, conventions or leisure, Hotel Treff Bistro can accommodate you in style and assist you with professional quick and convenient service, while offering a variety of amenities to make your stay a most rewarding one. Hotel-restaurant “Treff Bistro ” is located in the downtown (Shirok Sokak) area in a building with old, traditional, local architecture. 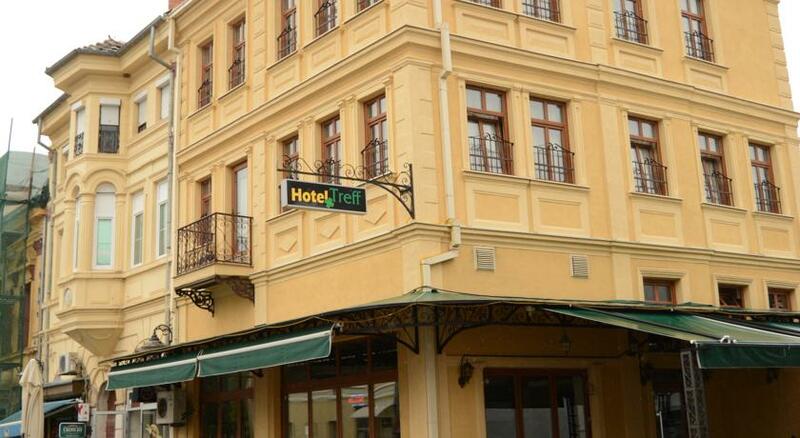 Numerous shops, restaurants and cafés are within 100 metres from the Hotel Treff Bistro . Bitola Main Bus as well as Train Station is 1 km away. Skopje and Skopje Airport are 175 km from Bitola, 68 Km to Ohrid, Оnly 15 km away from the Greek border. The building was completely renovated and equipped in 2015 as a contemporary hotel, built according to the highest standards. It has 29 rooms and 5 suite. All rooms are decorated with modern furniture and have air conditioning, cable TV, wireless internet, bathroom, and the suits have their own kitchens. The hotel has a restaurant with capacity of 200 persons which is available for organizing your celebrations, a cafeteria with the capacity of 60 persons.